while building your employer brand. 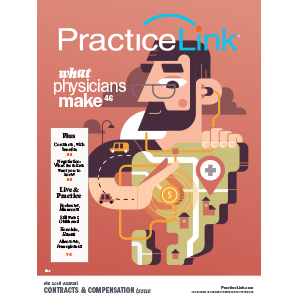 Advertising in PracticeLink Magazine allows you to promote your jobs to physician readers while branding your organization and differentiating your opportunities from your competitors'. Extended distribution means your ad is working even when you aren’t. 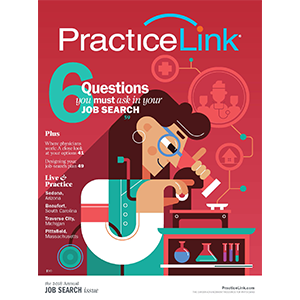 Each issue of PracticeLink Magazine reaches 80,000+ job-seeking residents, fellows and practicing physicians—including the most in-demand specialties like urology, dermatology, peds sub-specialties and more. On top of standard distribution, each issue is mailed to 5,000 providers to help advertisers reach specific audiences. Advertisers also receive exclusive lead reports from the magazine. Position yourself alongside trusted career content. Our award-winning feature articles pull in readers, and our comprehensive specialty, employer and geographic indexes point them directly to your ad! 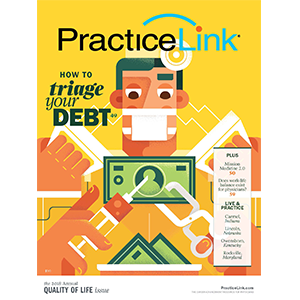 Named the Publication of the Year in 2014 from the American Society of Healthcare Publication Editors (ASHPE), PracticeLink Magazine publishes four quarterly themed issues each year to provide the content physicians they need when they need it most! Mobile app and digital editions extend your reach for not extra charge. Thanks to our massive print circulation, digital edition and iPhone and Android apps, our multimedia strategy helps you reach physicians wherever they are and however they choose to access content. And when you advertise in PracticeLink Magazine, you'll not only be included in the digital edition and apps but also receive a free Organization Profile Page on PracticeLink.com. Complimentary ad design makes branding easy. No ad? No problem! Let our award-winning design team put together your organization’s ad for no additional fee—then take it with you to continue your branding anywhere else you’d like it to run.For no extra cost, our creative team is happy to create an ad that meets your specifications to save you the time and effort of designing one yourself. Each quarterly themed issue is filled with compelling content for job-seeking physicians. What do clients say about PracticeLink Magazine? 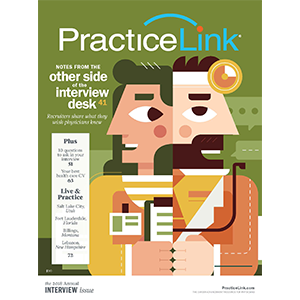 We love hearing about physician recruiters success with PracticeLink! Send us your story at ProTeam@PracticeLink.com. "I'm sincerely grateful for the efforts of the PracticeLink staff in creating such a helpful, informative magazine. While it s directed toward physicians, I find as a recruiter that I learn much from it as well. In it I find relevant topics presented in a smart, positive way with a distinctly human touch. A lot of recruiting materials pass over my desk, but I always look forward to the arrival of the PracticeLink Magazine." "The magazine has been great. Actually I had an ENT candidate a couple of weeks ago that actually brought the Interview Issue with him, and he had tagged the pages, and he used it as a great resource, so seeing a candidate bring that to fruition with PracticeLink s goal of providing a great resource to residents it was really a cool experience." I just got my new PracticeLink Magazine, and it couldn't be more timely. I have been asked to speak to a group of medical students about interviewing and CONTRACTS! The Interview Issue was so popular, and the residents I am working with appreciated getting a copy." I ve been using PracticeLink for 15 years. PracticeLink is our most profitable job board that we use. We have more candidates that we interview and hire from PracticeLink. We have found there s a good return on [PracticeLink Magazine], and we find that many candidates are seeing that magazine and contacting us.